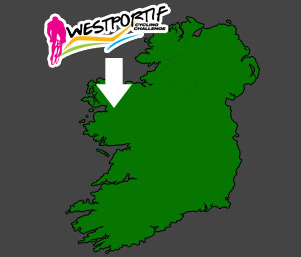 Westportif is the main event that we help organise from our Clubs perspective. It brings all the various cycling groups together such as our youth, leisure, ladies, sportive and racers. We notice that everyone wants to help out with making sandwiches, buns and drinks to directing traffic and marshalling. The event has been running for a number of years and has steadily grown year on year and while we know that we have some of the most scenic cycling routes in the world what better way to enjoy it than on a bike with all your friends. In a community based club its great to have such a main event as it serves to gel the club together as everyone understands how big of an event it is and put's their shoulder to the wheel.....albeit a bike wheel. Westportif allows us to showcase the beautiful landscape that we are lucky enough to cycle in every week. It’s only when you cycle with a group of friends through the Doolough or Inagh Valley or experience the sheer joy of climbing to the summit of Ail Dub, Maam Trasna and Lallys Mountain, that you really appreciate how lucky we all are to live in this stunning part of Ireland. The club is all about doing and experiencing things together and promoting cycling in our area. If Westportif can inspire people to continue to cycle and can encourage people to live a healthy lifestyle, then that’s worth doing well.